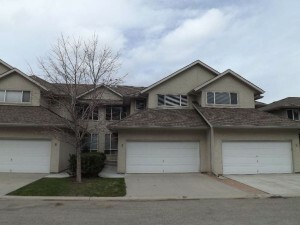 Executive style two storey townhouse with unobstructed river valley views. There is over 2,500 square feet in this home. The main floor features a large living and dining room with high vaulted ceilings, gas fireplace, a two piece powder room, the kitchen has a lot of storage and overlooks the nook, family room and large patio with beautiful views. The family room also features a gas fireplace. The second floor features 2 huge bedrooms with their own 4 piece ensuites and laundry. The basement features a large rec room with a patio off of the rec room and grassy area. There is also a bedroom, 4 piece bathroom and lots of storage (including a crawl space). Other extras include natural gas BBQ hook up, level entry to the main floor from the garage/front door, built in vac, 2 car garage with room for 2 more vehicles in the driveway. Pets allowed with restrictions and no rentals. Great home with tons of potential! 24 hours or day before notice a must.